The former Wales and British & Irish Lions scrum-half Anthony O’Connor has died at the age of 81. Capped five times for his country, he captained Aberavon in the 1957/58 season. Born in Neath on 24th April 1934, and educated at Duffryn Grammar School, he went on to study at Bristol University and then read Research Crystallography at Oxford University's St Edmund Hall. He played in the 1958 Varsity Match at Twickenham, partnering the Australian international Ross Sheil at half-back, in a game which Cambridge University won 17 - 6. Having captain the Wizards in the 1957-58 season, he played for Oxford University and London Welsh in the 1958-59 campaign and earned his first Welsh Trial four days after the Varsity Match in December, 1958, alongside the Light Blue centre, Geoff Windsor Lewis and Haydn Davies. He played for the combined Neath & Aberavon XV against the touring Australians in 1957, South Africans in 1961 and New Zealanders in 1963. He won the first of his five Welsh caps (Cap No 656) against the Springboks at Cardiff Arms Park in 1960. Wales lost that game 3 - 0 with O’Connor partnering Ken Richards at half-back in atrocious conditions. A month later he met the Springboks again at The Gnoll, when he scored a try in the 25 - 5 defeat suffered by the combined Neath & Aberavon XV. He held onto his place in the Wales team or the opening two games of the 1961 Five Nations Championship, a 6-3 home win over England and a 3 - 0 defeat against Scotland at Murrayfield, but had to give way for Onllwyn Brace and Lloyd Williams in the next four Tests. Wales won only one of those games and O’Connor returned to partner Maesteg’s Alan Rees against France in Cardiff on 24 March, 1962. 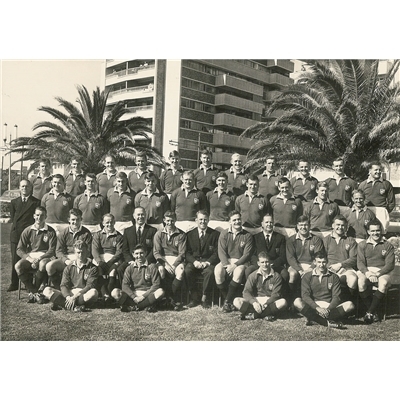 Wales won that game 3 - 0 and six days later O’Connor found himself selected in the Lions squad to travel to South Africa. England’s Dickie Jeeps was the only other scrum half on the tour, his third in a row, and he played in all four Tests. O’Connor played in 10 games on the tour and was never on the losing side. He made his fifth and final appearance for Wales in the 3 all draw with Ireland in the ‘Smallpox’ hangover match at Lansdowne Road on 17 November 1962. He played twice for the Barbarians and helped Aberavon win the ‘unofficial’ Welsh Championship in the 1960-61 season when they won 40 and drew 4 of their 48 games. On leaving Oxford University he joined ICI as a research physicist and in 1968 he became the Assistant Research Manager at the British Steel Company of Wales. He lived in Porthcawl in later life and in 2005 was captain of the Royal Porthcawl Golf Club. O’Connor died on Friday 22 May 2015.